Borger, TX - A rare type of snow is falling in areas of the Panhandle. The snow is not coming from a typical weather pattern, but rather from industrial plants. It's snowing in parts of Amarillo...and in some areas of Borger, while it wasn't snowing in other areas....all because of an out of the ordinary event. 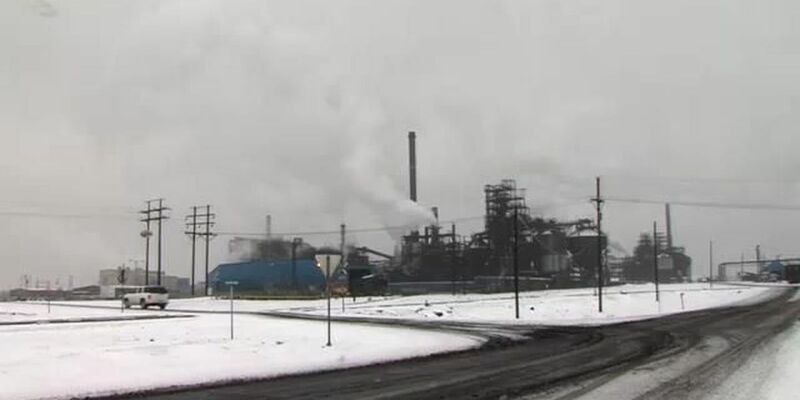 "It's basically called an Industrial Snow Event, where we have warm heat and steam coming off the power plant and off the carbon black plant up around Borger, as that moves up in the atmosphere it condenses into snow, it's a very narrow band of snow, but it has the capability of dropping several inches," said NewsChannel 10 Meteorologist Allan Gwyn. Borger got about 3 inches of snow last night and are expected to get even more, but experts say that even though the snow is coming from the industrial plant it's not dangerous," Gwyn explained. "I want to emphasize that just because it's with the power plant or with the carbon black plant, it's not dangerous, there's no weird chemicals or anything like that, it's just good ole fashion snow being created by the steam," said Gwyn. But residents living near Borger say it's still snow. "It's really icy and people are not going to work because of the snow," Resident Heather Pyle said. "I don't like it, it's nasty and it's so hard to imagine the plants did this and the cloud cover, in just one small area...unreal," said Resident Judy Wolfe. "It's a narrow band you might drive through it and it might be half a mile to a mile wide on either side of that, absolutely nothing," Gwyn said. When we went to one part of Borger there was not any snow... And then drove south... And as you can see it went from no snow to quite a significant amount of accumulation. "This is such a rare event that the conditions have to be almost exact for it to happen," explained Gwyn. We will warm into the 70's with breezy winds. Gusts up to 30 mph will be possible. Warmer temps to end the week.